CliC donated nearly 250 pairs of reading and sunglasses to assist patients suffering from presbyopia or low vision who don’t have access to optical or medical facilities. 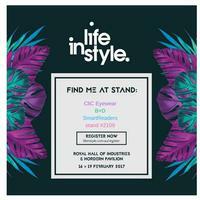 Life Instyle is Australia's only boutique trade event showcasing emerging trends, brands and products. This is the official site for CliC Products in the South Pacific region. Our Gold Coast headquarters manage the distribution, wholesale, retail, media and publicity of the brand within the South Pacific. Be aware that many inferior 'copies' of clic glasses now appear online and on the streets, so make sure you look for the clic branding and only settle for the original and the best!